A new look Jason Griffiths will take to the racetrack this season in the colours of new sponsor Team Morris Holdings*. The outfit will supply Jason with a brand new Yamaha R71. And it doesn't stop there; they've also brought V&M Racing on board to prepare the bike to full race specification. In addition to the Morris Holdings R71, Jason will be competing the 2001 campaign with a Yamaha R6 and a Production R1, both courtesy of Road and Track Motorcycles, while Dennis Trollope Racing is supplying a TZ250 Yamaha. And to cap it all Jason has also been made President of the Joey Dunlop Injured Riders Fund (IOM). The R71, which Jason will ride at the Isle of Man TT races, the North West 200 and the Ulster Grand Prix, is being given the V&M racing treatment. By enlisting Jack Valentine and Steve Mellor's expertise, which has led them to a string of victories across the United Kingdom and beyond, Team Morris Holdings show they mean business and they won't be on the grid to make up the numbers. "This is brilliant news," enthused Jason. "V&M's reputation goes before them, everyone knows the success they've achieved and to have their knowledge on board is a massive bonus. The machine is already awesome but their expertise could be the difference between first and second place." He'll be riding the R71 in the prestigious Formula One and Senior T.T. races, and the two Superbike events at the NorthWest 200. Jason's also looking to continue the success he has enjoyed with Road and Track Motorcycles. The Isle of Man Yamaha dealer has lined up a tuned R6 Yamaha (with the added spice of engine preparation by V&M!) for the Junior TT and the Supersport race at the NorthWest 200 plus the R1 for the forthcoming production races. "I've had some good times courtesy of Road and Track," he said. 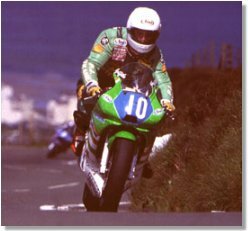 "I finished second on their bike in the 1999 Production TT and fourth at last years NorthWest. The boys know me and they know what type of machine you need to succeed." Dennis Trollope Racing, another long-time associate of Jason's, is providing the ultra-quick TZ250 Yamaha, which he'll ride in the Lightweight TT. Meanwhile, negotiations have been taking place with Chrysalis Racing with a view to riding their Single cylinder machine at the TT again. Last year he finished second on the AM/DM bike as well as enjoying some great results in Europe in the Mono series. An announcement is imminent. "All in all, the faith shown in me by Team Morris Holdings, Road and Track and Dennis Trollope is a great confidence booster," said Jason. "The machinery's in place for me to succeed, it's now down to me to make sure great bikes become winning bikes." 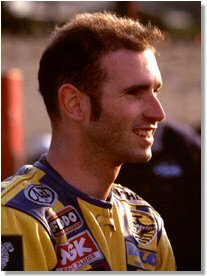 Jason has also been named as President of the Joey Dunlop Injured Riders Fund (IOM). "It's a great honour," said Jason. "It's also very humbling. Joey was an inspiration to us all. Motorcycle racing can be good to people but it can also be very cruel. I've enjoyed some great moments in my career without too much misfortune. Unfortunately, there's been those who have either never been able to fulfil their potential, or have had their career come to an end, because of injury. The fund is a great idea and gets my full support."